Flap's Dentistry Blog: WSDA Sponsoring its Own Mid-Level Dental Provider Legislation? 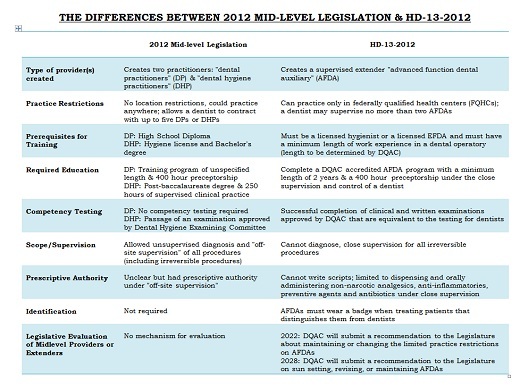 WSDA Sponsoring its Own Mid-Level Dental Provider Legislation? Looks like the Washington State Dental Association, a component of the American Dental Association has thrown in the towel and will sponsor their own mid-level provider legislation. Policy approved by the Washington State Dental Association House of Delegates Sept. 15 to create a supervised dental extender “will allow WSDA to enter the 2013 legislative session with a positive position based on maintaining the integrity of dental practice and safeguarding patient safety,” the House said. The WSDA House passed “a supervised extender as an alternative to the dental midlevel provider legislation we have fought against in Olympia during the last two legislative sessions,” Dr. Danny Warner, WSDA president, said in a letter to members explaining the new policy. The House approved HD-13-2012 by a 58-20 margin with one abstention as a response to “this campaign for dental therapists” and with the stated intent of deterring legislation for new oral health workforce models. The legislation would expand the scope of practice of expanded function dental auxiliaries and create advanced function dental auxiliaries limited to working in federally qualified health centers (FQHCs). The ADA and the Dental Hygiene folks are involved in a turf war on a state by state basis. There will eventually be a national debate in the Congress, but this may be many years away and much harder to affect any change since the states control licensing of dentists. Dentists want to preserve the status quo where private dentistry is the norm and dentists call the shots. Dental hygienists want a piece of the financial pie and want to be allowed to provide more services without burdensome supervision by dentists - more profit for them. The large charitable foundations, also have some skin in the game, are run by left-wing ideologues who are attacking private dentistry and favor government control. With ObamaCare on the horizon for children's dental services, who will win is still up in the air.